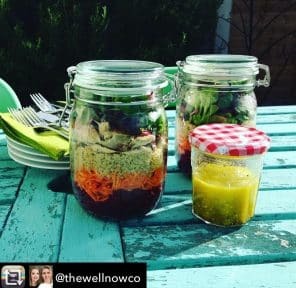 We love this summer salad from IHS grads Suzanne and Jessica @thewellnowco that we have made it our recipe of the month. Enjoy! If you’re looking for some salad inspiration while the hot weather is still with us (just about! ), this Stripey Mackerel Salad is a total winner It’s bursting with nutrients and flavour and can easily be put together the night before for a healthy work lunch. Mackerel can be replaced with tuna, salmon or any other fish or meat that takes your fancy! 1. Cook the quinoa and allow to cool fully. The best way I find to cook it is to measure out the quinoa as 1 part, rinse it in cold water in a sieve, and cook in 2 parts boiling water. Boil for approximately 12-15 minutes. Keep an eye on it and stir frequently so it doesn’t stick to the pot. Add some boiling water from the kettle if all the water has been absorbed and it still needs a bit more cooking time. Leave to sit in a sieve while you fluff it up to serve hot or to cool down for a salad. 2. Using a processor with the grating blade, grate the peeled beetroot first and add to the jars. Rince the food processor bowl in a little water just to keep the carrot free from the beetroot pink. 3. Grate the carrot next. It’s up to you if you want to peel it or not, but make sure to wash them if you aren’t peeling them. Layer in the carrot in the jars. 4. Then layer in the cooled quinoa, followed by the mackerel in one of the jars, then the salad leaves. 5. Place all the dressing ingredients in a jar and shake with vigour. Either pour into the salad jar just before serving or onto individual plate. 6. Keep in the fridge until packing your bag or setting the table.